Immediately after Orfanotrofeio was evacuated, bulldozers marched in and demolished the building, an abandoned orphanage “donated” five years ago to the enterprising Greek Orthodox Church by a previous government. Under the rubble were buried tons of clothes, foodstuffs and medicine collected there by grassroots solidarity structures to be distributed to refugee families in need. Hours later, No Border Kitchen, an autonomous structure providing food to refugees in the island of Lesvos, was also forcefully evicted by the police. 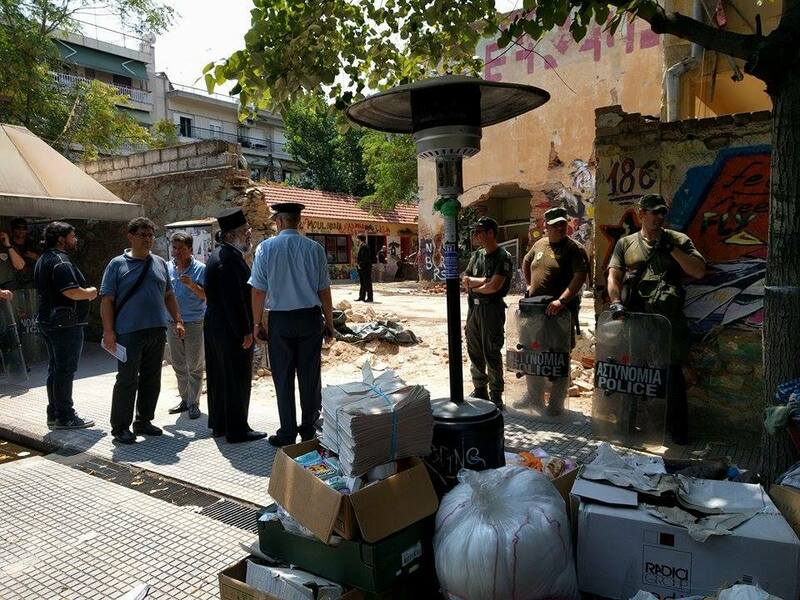 On the next afternoon, the 74 occupants of the three occupied shelters were transported to Thessaloniki’s courthouse in handcuffs by heavily armed police, where they were cheered upon entering by hundreds of supporters, despite the debilitating heat of the Greek summer. The nine occupants of Nikis squat were condemned to four-month suspended sentences for occupation of a public building. The trials of the 65 occupants of the Orfanotrofeio and Hurriya shelters were postponed due to lack of interpreters; everyone was provisionally freed. 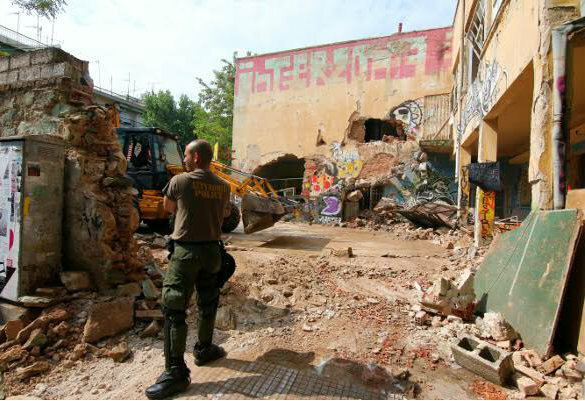 Charges include “disruption of household peace” and “damage to property” — this last one an accusation fabricated by greedy owners who demand large compensations for supposed damages to their long-abandoned and unused buildings. 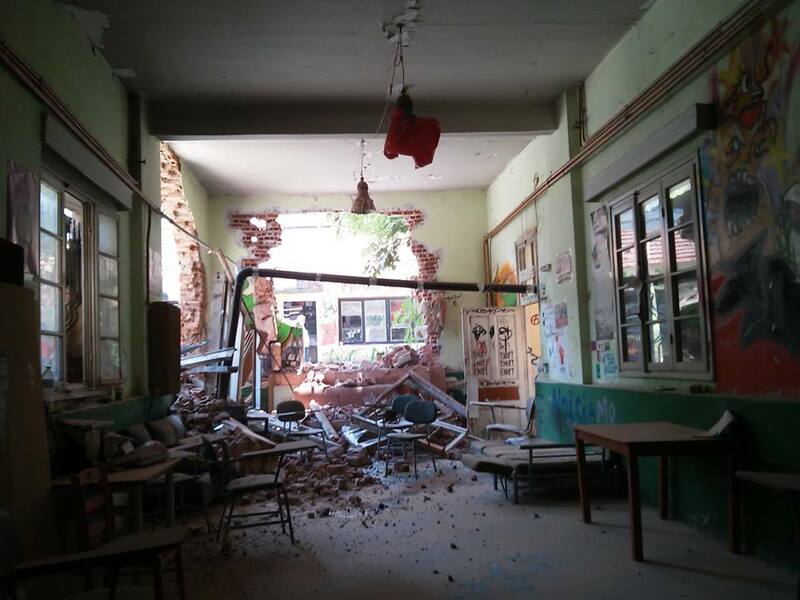 The response of the movements to the attack was swift and included the symbolic occupations of the headquarters of the governing Syriza party in Thessaloniki and other cities; marches and protests all over the country; the occupation of the Drama School of the local university, to be transformed into a center of struggle; and the rescuing of the refugees who were transferred from the occupied shelters to refugee camps — most of them vulnerable — back to safe places. To that we should add the mobilization of a big volunteer legal team to organize the defense of dozens of activists in three separate trials. Nevertheless, the response was asymmetrical, as by Wednesday’s operation the police liquidated in just one day a great part of the infrastructure patiently constructed by the grassroots movement for solidarity with refugees over the last year. 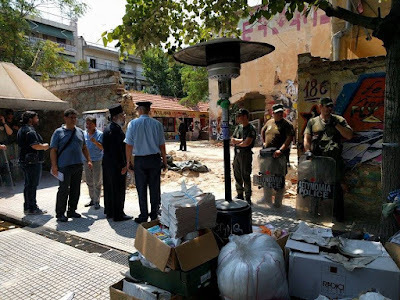 The raid and eviction of the three occupied refugee shelters thus marks another episode in the undeclared war of the Greek government against grassroots solidarity efforts. Since the summer of 2015, when Greece became the main path to Europe for people fleeing war, repression and poverty in Asia and Africa, the refugees who crossed the country encountered the Greek people, who had endured five years of austerity shock treatment, who had seen their lives degraded and their social, political and labor rights vanishing in a very short period of time. Despite the hardship, the ordeal of the refugees was generally not met with xenophobic reflexes, but with authentic empathy and solidarity on behalf of the population. The voices of the extreme right — which only a few years back had been organizing pogroms against immigrants in collusion with the armed forces — were marginalized, and Greek society generally demonstrated an outpouring of solidarity towards the immigrants. The old xenophobic maxim — “if you like the refugees so much, take them to your home” — was actually put into practice: thousands of Greek homes were opened to host refugees, especially the most vulnerable ones — the sick, pregnant women and families with little children — sometimes as an intermediate stop to recover their strength before regrouping with family in the north of Europe, but often as a more lasting arrangement. Millions of rations of home-cooked food were taken to the camp of Eidomeni by ordinary people, where great numbers of refugees lived in deplorable conditions in tents and makeshift homes, waiting for a chance to cross the border to the north and continue their path towards northern Europe. This heartwarming response on behalf of Greek society marked a moral victory for Greece’s social movements, which throughout the years of the crisis have not only been resisting the assault on the popular classes and creating grassroots alternatives, but have also been combating racism, xenophobia and fascism at all levels: in the neighborhood, in the streets and in public discourse. From the very beginning, the resources and infrastructure of the social movements, however limited, were mobilized to provide support and relief to as many as possible of the nearly one million refugees who crossed the country. The network of solidarity clinics — volunteer grassroots structures that were created some years back to offer primary healthcare to uninsured Greek and immigrant workers — actively took part in caring for the refugees and denouncing the health hazards in the government’s treatment of them. Social centers — notably Micropolis and Steki Metanaston in Thessaloniki, Nosotros and Votanikos Kipos in Athens, and a host of others — created points of contact for refugees, and put their existing infrastructures, like collective kitchens, food stores and kindergartens, at their service. Local and international grassroots organizations set up autonomous relief structures — parallel to those of the state and NGOs — in Eidomeni and other areas where refugees were concentrated in high numbers. The occupied self-managed factory of Vio.Me in Thessaloniki made available a warehouse for the collection, storage and transportation of basic items like clothes, sanitary items and baby food that had been gathered by solidarity collectives from all over Greece and Europe, prior to shipment to the Eidomeni border to be handed out to refugees. Most importantly, militant collectives and groups of refugees occupied a host of empty buildings throughout Greece, to be used as self-managed refugee shelters — notably Notara and City Plaza in Athens, as well as Orfanotrofeio and Hurriya in Thessaloniki. Other long-existing squats opened their doors to refugee families, including Nikis squat, evicted by police last Wednesday. Evidently, the capacity of these self-managed and self-financed structures to make a quantitative impact on the plight of the nearly 57.000 refugees currently stuck in Greece is limited. However, they mark a qualitative difference from the efforts of the state and the NGOs, which dominate the relief efforts. Undoubtedly, the Greek state did, after all, mobilize its resources to deal with the unthinkable humanitarian catastrophe by rescuing those who tried to cross over by boat from Turkey to the islands of the Aegean Sea. This marked an improvement compared to previous years, when the Greek coastguard notoriously practiced on-the-spot deportations. As recently as August 2015 they were even accused of actively trying to sink boats full of refugees. Nevertheless, for the Greek state the plight of the refugees is primarily a matter of public order, and hence a field for the intervention of the armed forces. The care for refugees and the provision of basic needs is left to the hundreds of NGOs active in the area — many of them well-established and others founded overnight — which take advantage of the flow of local and European funds towards aid projects. Although the selfless and exhausting efforts of aid workers, who have to deal with incredibly strenuous situations, often in low-waged and precarious conditions themselves, are deserving of respect, the monopolization of aid by NGOs signifies the privatization of “solidarity”; its subsumption under quantitative goals, laws of efficiency and cost-effectiveness. In a way, it signifies the creation of lucrative new markets out of human misery. What makes the efforts of grassroots movements stand out in relation to the actions of the state and the NGOs is that they are motivated by different political imperatives. Contrary to the flow of aid from highly centralized organizations towards disempowered refugees, true solidarity flows horizontally among peers. Those who practice solidarity recognize themselves in the “other” and are motivated by empathy, not pity. In occupied refugee shelters, managed as commons through participatory methods, locals and refugees cook together and eat around the same table; they take decisions together in the circle of the horizontal assembly; they recognize each other’s culture and customs and overcome preconceptions and stereotypes. Against the enforced segregation, solidarity initiatives create a common language and common spaces of action for locals and refugees. Furthermore, where state policy wants the refugees “hidden under the carpet” — away from cities, crammed in military-run refugee camps in inhumane conditions — grassroots solidarity places them at the center of social life, where they can be accepted and included within society. Where European policies classify and selectively deport immigrants according to their origin, grassroots solidarity calls into question the distinction between “immigrant” and “refugee”, since in humanitarian terms it is not important whether displaced people are fleeing from wars or from poverty and repressive regimes. Most importantly, where the state and NGOs treat the refugee crisis as if it were an inevitable natural disaster, grassroots solidarity denounces its root causes: the imperialist wars in the Middle East, the neo-colonialist dispossession of local farmers by multinationals in Africa and Asia, the inhuman immigration policies of “Fortress Europe” and, especially, the insistence on closed borders, which forces fleeing populations towards the sea routes — resulting in immense loss of life — and into the hands of a lucrative people-smuggling market. There is no doubt that the activity of grassroots solidarity movements is on a collision course with the project of European integration, which envisions a strict international division of labor, national populations in perpetual competition in a collective race to the bottom, and borders permeable only by capital and goods — excluding immigrant human bodies, which are conceived only as a rightless reserve army of labor at the fringes of the formal economy. In Greece, the focal point of the refugee crisis, this collision took the form of a spiteful scare campaign by the mass media against grassroots solidarity efforts, which were blamed for everything that could go wrong in the places where thousands of people were stowed away under inhuman conditionsas a direct result of European immigration laws. In time, these attacks were used as a justification for the exclusion of social movements from Eidomeni, and after the dismantling of that camp, from the “provisional” refugee camps set up by the state in former industrial areas on the periphery of Greek towns. Special controlled zones were created where only “accredited” aid workers are allowed, and efforts to interact and collaborate with the refugees are met with repression. The scaremongering and repression culminated during the No Border Camp in Thessaloniki between July 15-24, when thousands of activists from around the continent met to protest — along with the refugees — the conditions of neglect and confinement in refugee camps and the impermeability of national borders that led to the present state of affairs. Mainstream media reporters documented and criticized every detail of the No Border Camp, which took place at occupied university grounds, after a last-minute refusal of the university authorities to grant permission to the organizers. A carefully calculated scare campaign during the camp was used to pave the way for the repressive operation of July 27, with the eviction of three occupied refugee shelters. True to the surrealist political climate in Greece in the last year, the governing Syriza party condemned the raids as an “attempt at the criminalization of solidarity endeavors that runs contrary to the principles and values of the left,” while government officials blamed the police operation on the initiatives of the public prosecutor. An outside observer might be inclined to believe that the government is simply unable to control its own police forces — after all, this excuse is routinely offered by pro-government sources, such as when riot police violently repressed a peaceful protest for the self-managed Vio.Me factory in early July. However, on closer inspection, it seems patently absurd that such a complex, coordinated and targeted police operation could be carried out without being green-lighted by the police’s political bosses. In a very convoluted line of argumentation, where in just a few paragraphs he invokes “the values of the left”, “the struggles of the working class”, “the protection of democratic rights” and the “needs of society” to justify the attack on the solidarity movements, he states: “The left is not about autonomy. It is about the defense of labor rights, of society, of democratic rights … We don’t need the autonomous actions of a bunch of kids; we want a mass popular movement, we should turn the youth towards the parties of the left.” He concludes by accusing solidarity structures of being “piecemeal efforts” that offer help to a reduced number of refugees, in contrast to the organized efforts of the state. To put it bluntly, society is not and should not be the subject of its own liberation; it is rather the passive object of concern and field of intervention for a benevolent government. Social struggles that are not mediated by the state and the parties of the left are either infantile or a threat to social peace — probably both. This totalitarian conception of society, public space and collective action is not new to leftist thought; only in its most recent incarnation it is combined not with state-guaranteed welfare, but with neoliberal dispossession and a state of “permanent exception” — a truly explosive mix. Just as the minister was done bragging about the state’s capacity for aid compared to social initiatives, a report by the public organization Hellenic Centre for Disease Control and Prevention (KEELPNO) was made public, which — based on a series of health inspections in sixteen migrant and refugee centers across Greece — concludes that thousands of people are crammed into the reception centers under substandard sanitary conditions, with precarious living accommodations and inadequate water and sewage facilities. The report advises the immediate closure of the camps and the integration of refugees within society — precisely what the grassroots solidarity movements, now officially under persecution for “not being in line with the interests of the state,” have been demanding since the start of the refugee crisis. Furthermore, on July 28, just as the detained in the three eviction operations were provisionally freed pending trial, a young Syrian woman was dying of heart failure following an epileptic attack in the refugee camp of Softex near Diavata, on the periphery of Thessaloniki — a death which could have easily been prevented, had there been permanent medical care at the camp, or had the woman been taken to a hospital in time. The death sparked an intense protest at the camp, with refugees demanding humane living conditions. Despite its rhetoric, the government’s actions are another instance where the left is called upon to finish off what the right has been unable to do for years. Just as a third austerity package for Greece would have been impossible without a government “that has society’s interests at heart” — Prime Minister Tsipras famously wept while he signed the new memorandum — so a repressive operation as complex and calculated as the one carried out in Thessaloniki would have been impossible without a Deputy Minister of Civil Protection concerned about “the needs of society” and “the struggles of the working class.” In an artful inversion of the left’s vision of social emancipation, “workers’ struggles” are used to justify private property over social necessity; “democratic rights” are used to justify unwarranted repression of those standing in solidarity with refugees; and “the needs of society” are used to justify a campaign of dispossession against the popular classes. It is evident now in Greece that the neoliberal left and the neoliberal right are two variations of the same project — a project that requires a disciplined, atomized, obedient population, preoccupied with maximizing individual benefit, having relinquished any kind of collective action to change society. The tragic events of 2015 — when the will of the people to end austerity was ignored and one more anti-austerity opposition was transformed into an enforcer of neoliberal restructuring — might well have pushed in this direction, by demobilizing the social movements and generating widespread resignation. Solidarity in Greece is now criminalized, declared contrary to the interests of the state. However, there is a part of the population that remains determined to keep trying to give content to the word “solidarity”, to wrest it from the hands of repressive institutions, electoralist projects and lucrative non-profit organizations, and to transform it into the basis of a collective aspiration for a better life — built from the ground up on egalitarian and participatory terms. The author would like to thank Mary Diakopoulou, a member of Micropolis Social Centre, and Elektra Bethymouti, a member of Thessaloniki’s Social Solidarity Clinic, for their invaluable contributions to this text.